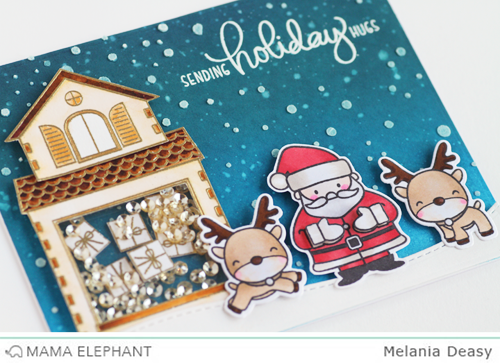 mama elephant | design blog: Twinkle Towns and Reindeer Games with Melania! Twinkle Towns and Reindeer Games with Melania! Hi everyone! It's Deasy here. 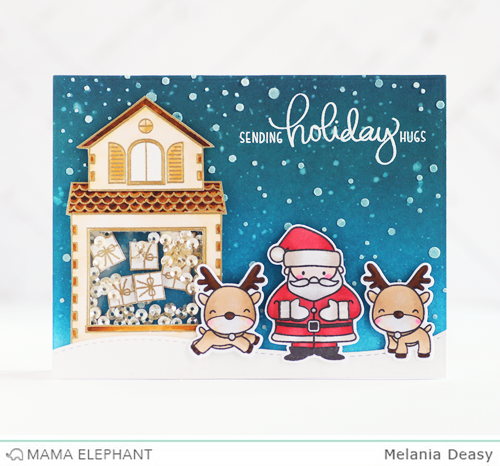 Today I want to share my cards that combine Mama Elephant old stamp set with the new Holiday stamp set and I made it as a shaker cards. It's so fun! First I stamp the ornaments with masking technique and stamp the branch. I coloring the branch using Copic and coloring the ornaments with Dye Ink and blending tool using masking technique. I made the ornaments into shaker with die cut it with circle dies. To make the background, I'm using stencil with Dye Ink and blending tool. The sentiment is from gold embossing powder. Landscape Trio Creative Cuts to die cut the hill. I coloring the Santa and the reindeer using Copic. For the Santa's workshop and the gifts, I'm using gold embossing powder. The sentiment is from white embossing powder. To make the background, I'm using Dye ink with blending tool and splash some water with my brush. I also add the snow using stencil and white embossing paste. Adorable!!! Love these cards so much! Your cards are so amazing. I love the classic colors and the traditional colors and most of all you placed them into shaker cards. Great job on the back grounds on both cards it makes those images pop!!! Thank you for sharing your cards. Can you say FABULOUS!!! Absolutely love it!! Amazing cards! Both of these cards are adorable! The ornaments make the most creative card ever! Both cards are fantastic. First card so pretty in pastels!! Love these adorable designs! I'm so glad I have Twinkle Town! 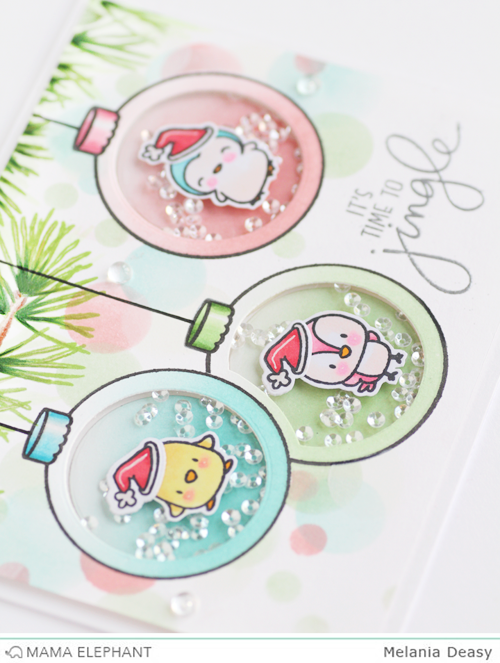 Your ornaments are so sweet and I love the non-traditional pastels! Oh My Gosh! How adorable are these cards? I've never done masking before and I would love to try. I think I will YouTube the technique and the snow globe technique too. I am going to save these to my crafts folder so I can try this. Thank you for showing this to us and hey, my mailbox would be smiling if it got these cards. The ornaments card is gorgeous!!! ♡ 😍 The other one is beautiful too! This is one of those times I opened my email and literally said "YOU'VE GOTTA BE KIDDING ME!!!!!!!!!!!" (And I mean that in the most flattering way possible!) These are both so amazing Melania.. You are incredibly talented!!!!!!! Melania's cards are just beautiful! I love how she pairs her stamps and dies to create such lovely designs! Your cards are fabulous! Thanks. OMG I love the sending Holiday hugs card the best. The presents in the shaker window are adorable! After exploring a number of the blog posts on your web site, I truly like your technique of blogging. I book marked it to my bookmark site list and will be checking back in the near future. Take a look at my web site as well and tell me how you feel, useful reference.